Plot Summary: Dr. Tatsunoko leads an underwater exploring team for research on the mysterious radiation that's found within a giant clam. The research team opened up the clam and found a giant pearl that's the source of the radiation. 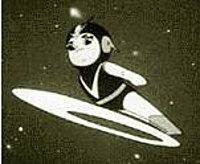 Upon returning the pearl to the Tatsunoko Research Center, Dr. Tatsunoko & his daughter Asari found an object that resembles a medallion. It had a message in it stating that a being from the planet Parlum is inside the pearl they uncovered. Suddenly the pearl started to crack like an egg, and thus appeared before them was an unusual looking boy. In the medallion's message it mentioned that the boy's name is Ace, and with his flying silver ring used as an aircraft and a weapon, he is able to go on missions in order to protect Earth from threatening alien invaders.